The emulator removes defective occupancy mat error. Instead of replacing faulty seat mat (which requires de-installation of the seat) you can plug in the emulator which is a safe and inexpensive solution. The device sends a signal about the presence of a passenger on the seat (even in his absence). Mercedes-Benz cars with a seat mat plug with 3 wires (colors: red, white, brown or black, brown, blue). This emulator will not work with mats with 2 or 4 wires. Please check your mat before purchase. This emulator will NOT work with cars sold in USA and Canada!!! Cars sold in USA and Canada after 2004/2005 have a seat mat with 4 wires. This emulator solves the SRS error caused by a faulty seat mat. Please be advised the errors appearing on the dashboard are NOT an indication that a seat mat is broken. Mercedes has a few sensors that can cause the SRS/airbag warning light. You have to perform scan with a diagnostic tool (we recommend the Star Diagnosis) to make sure your problem is related to a faulty seat mat. Airbag warning light or SRS error is on. Scan your car with a diagnostic tool. The most common errors related to a faulty seat mat are: "Component B48", "9025". Take a photo of the error. It might be helpful in the future. If the errors are "short circuits" or "open circuits" we advise you to visit your local car electrician before purchase. Usually these errors indicate problems with electric installation (there might be damaged/loose wires or connectors). The emulator will not solve these problems and will not work with damaged electric installation. It will be like plugging an electronic device to a power socket with damaged or disconnected wires. Turn the ignition off. Find the seat occupancy sensor plug under the passenger seat and replace it with the emulator's plug. Install seat belt emulator and reset the fault codes using a diagnostic tool. Turn the ignition on. The LED light on the emulator should start to blink alternately blue/green or red/green light (depends on the emulator). The airbag warning light/SRS light should be turned off. In case of an accident, airbag will ALWAYS deploy - with or without a passenger on the seat. 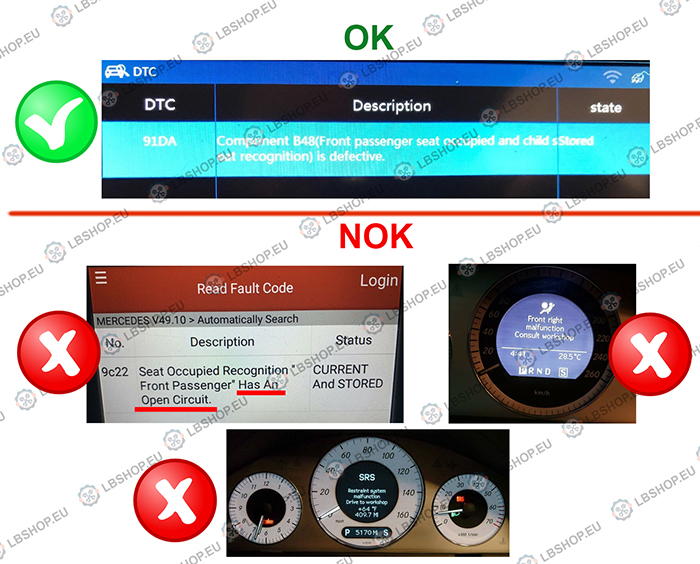 No blinking lights or one color missing mean there is a problem with proper communication with the Airbag Control Unit. Let us know if the device is not working properly or is defective. We will help you solve the issue, replace the emulator with a new one or cover the return shipping and give you a full refund. The device is for diagnostic use only. 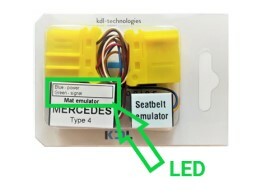 The emulator is not a factory equipment of Mercedes and should only be used as a short term temporary occupancy bypass solution until you replace the original seat sensor. We advise you to inform all users of your vehicle about the presence of the emulator. Do not not place the child seat on the front seat! Be sure that fitting this emulator is not against any law in your country. By purchasing you agree that we are not liable for any damages or losses that may arise from the use of the emulator and we are not responsible for any problems on your airbag system as this is a solution for a faulty passenger seat mat only. Under no circumstances, including but not limited to negligence, shall the seller be held liable for direct or indirect damages including but not limited to harm to any equipment and/or for personal injury/death arising out of the use, or the inability to use the bypass item sold on this website. How can I assembly this item in my car? Take a look at our 'Assembly instructions' section. Item as described - fast shipping - excellent seller - THANK YOU!